The group dance with a bundle of extras was confusing yet had good symmetry moments with a well danced Irish Jig. That blonde dude could get a job on Strictly next year maybe? Oh it was the cast of Lord of the Dance, Tess tells us. Tess and Claudia return tonight with the results. 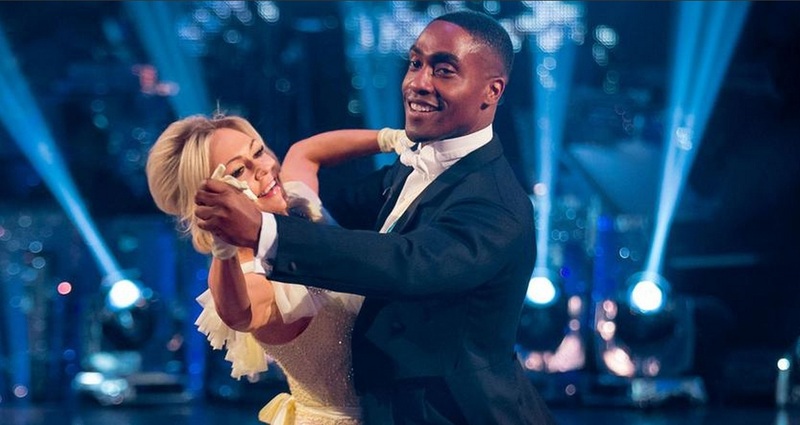 Making it through to the Quarter Finals next week is, in no particular order, – Simon and Kristina. Also through are – Caroline and Pasha. 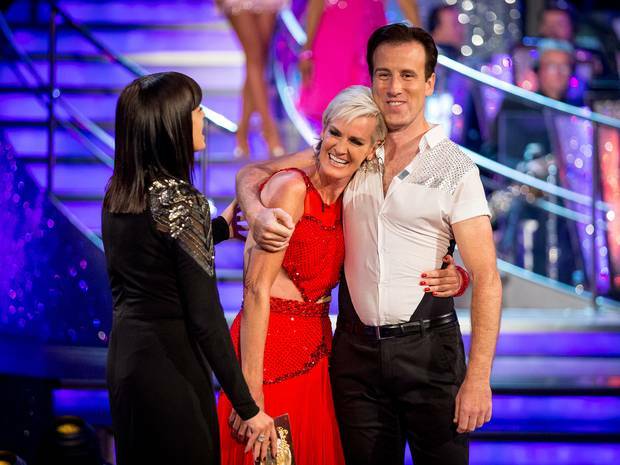 The first couple to face the dance off later is – Mark and Karen. Foretelling a magical tale with pure sound and beautiful voice, all involved made this joining of two classic legends outstanding. Amazing talents. Claudia’s stunning legs in a short dress looked great for her, have to say. Simon’s footwork was under Len’s guidance. Darcey talked about Pixie’s ballet moves. Craig’s score of 5 for Jake was under scrutiny. Claudia pointed out that “somebody bumped into him” but Craig defended the need for floor maintenance. 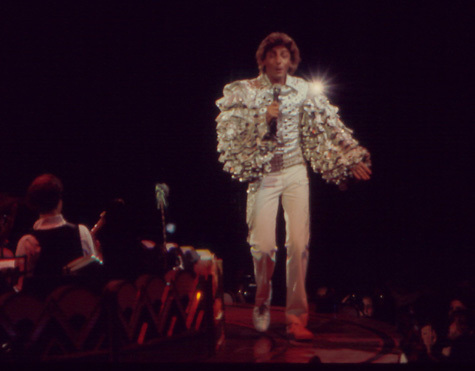 The extra dancers received criticism as Claudia noted and asked Len if this was a valid choice. Len defended the decision. Bruno discussed Caroline’s Charleston. Craig was tempted to give a ten but defended his reasons why it was a little short. Bruno was then seen suggestively pouted a Tulip around his mouth and face towards Len. 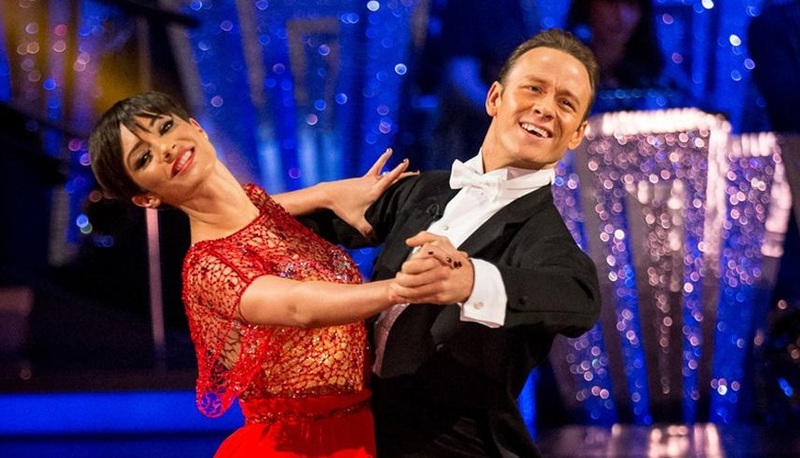 The swing a-thon in a group Waltz is back next week too. The results are back in with Tess now. Back again, still in no particular order, are – Pixie and Trent and Frankie and Kevin. 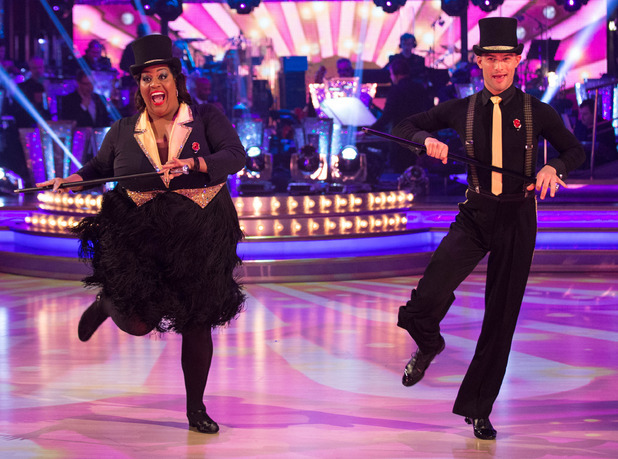 The second couple in the bottom two is – Sunetra and Brendan leaving Jake and Janette to dance again next week. Much more relaxed second time around and more graceful than before. When pressure is on, improves much more than usual. 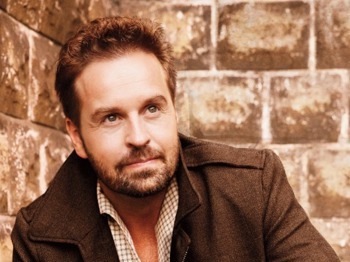 Probably not enough to save considering ‘fancy me favourite’ taking off clothes Mark. She should stay after better dance off. 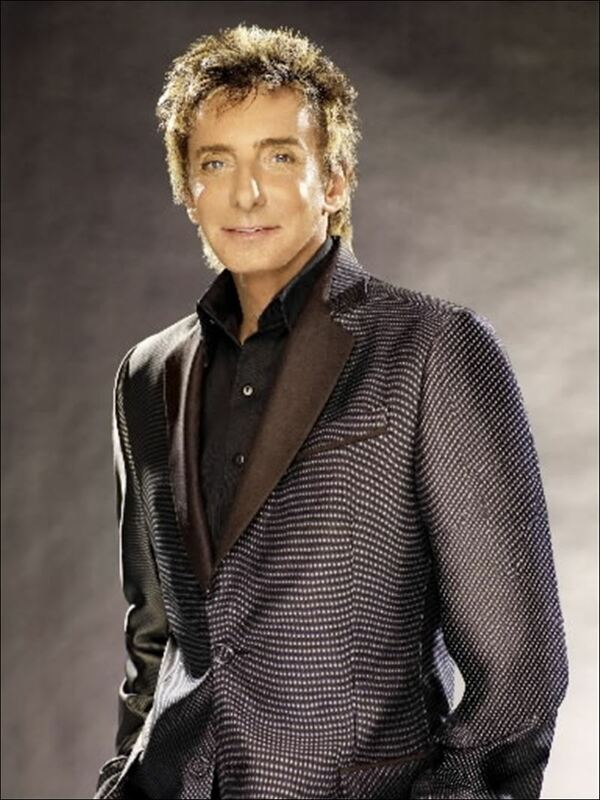 Mark’s lack of charisma continues to show no ethusiasm or pace. Timid, limp and relying on sad moments of stripping his shirt off. Wiggles hips again to save self. For a so called hunk, the only thing Mark seems to have is ‘flabs’ not abs. Terrible footwork and arm moves. Standing on spot dancing shows no attempt to dance at all. The judges vote to save. In the event of a tie, leading judge Len has the casting vote. Craig – Stood out was Mark and Karen. 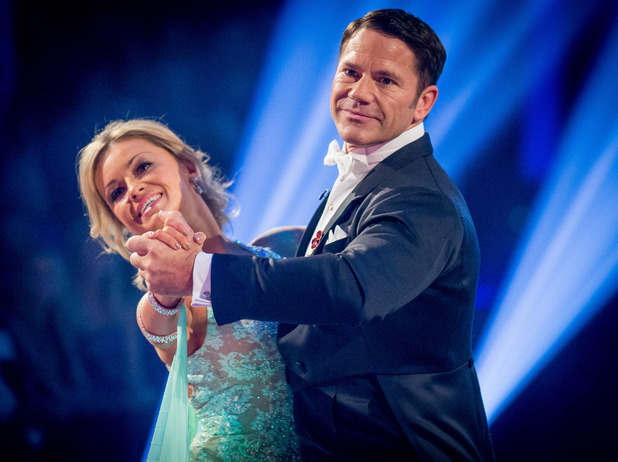 Darcey – Save is Mark and Karen. Bruno – Mark and Karen. Len – Did agree. Mark and Karen. Sunetra thanked her time on the show to the fans. Thank you to all the viewers who got me to week ten. Back from a brief absence is the loud cheering return of Claudia Winkleman and Tess Daly. 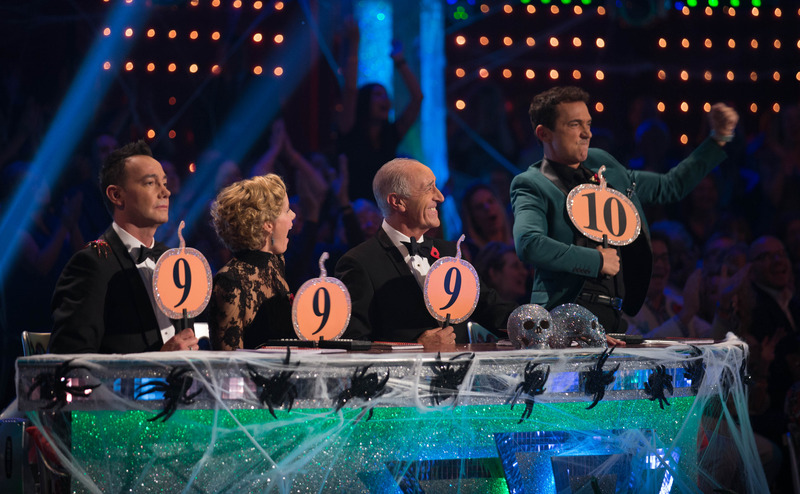 As ever the judges Craig Revel-Horwood, Darcey Bussel, Len Goodman and Bruno Tonioli. Our score is in brackets to mark accordingly amid the mass over marking delusion from the outdated judges bias. American football mad jawline lover Steve bursts through a paper like a teacloth to get on the floor. Boring, slow and empty steps. Ola joins to raise momentum by one pace. Awkward spin arounds in hold bobbing along. Pansy movements and limp choreography. Lame and boring. The judges are talking so much tosh so forget their irrelevant comments for now. Tess – “A four from Craig?! !” Tess, stop this trolloping. Everyone told you before, it doesn’t work dear. Good lift off stairs to floor setting mood. Good lone and together parts. Looking effortless. Sturdy and noticeable moment with footwork easily forgotten. Good centre platform use. Stunning lifts, elegant style. Smooth transitions. Mistake covered up as a pro. Good start but quite safe still. Arms little flimsy and cheap. Good push through on legs. Cartwheel done well but boring and slow. Good aeroplane hands. Not really a Charleston effect. Bit of jazzy theme but not much razzledazzle. Same as Simon now. Very safe and taking no risks. Could be out at this rate. Got to take a risk. Karen opens her arms as Mark comes up behind and turns her around with one moment moves and no effect. Slow boring move backs with no sharpness. Kicks tepid and pifty. Standing still to music. Dips Karen an inch to get a step ticked off. On the spot dancing with no sharp effect. Horrible. Doesn’t even bother trying. Lame finish on the spot lowering hands down to Karen, who falls down in routine. All teeth and no substance. What a charming pair. Frankie starts wafting skirt before being lifted off bench. Lots of arm waving about for no real effect . Too repetitive. Too long getting in spins around floor. Boring and tacky music. Kevin doing all work. Barely any skill on show. Good spin around but only real highlight. Ending meant nothing. Not much dancing at all. Great swivel down slant start. Instant rhythm and groove. Smooth hips and strong sass. Great leg extensions and backside jiggles. Fun filled and technically sound. Great musicaility. Got real dance skill. Needs high votes. Best so far. Fantastic. Sunetra waits for Brendan to join her in embrace. Smooth and graceful turns instantly. Controlled shoulder tilts. Very good footing. Beautiful elements of grace. Too hard a fling from Brendan nearly took her footing off. Warm and magical. Best of Sunetra yet. Kristina loves her magazine as Simon awkwardly enters the floor back hopping in. Decent lift but all too rushed and clumsy routine in dance. Simon gets solo moment to dance. Too many spins, not enough partner connectivity to create meaning and very haphazard trying to throw everything in missing the whole point. As much as he tries he just hasn’t got it. Pretty boy has reached limit. After a great group dance, Tess and Zoe are back with the results. Making it through to the next stage of the show, in no particular order is – Caroline and Pasha. Also joining are Pixie and Trent and Jake and Janette. The first to fall into the dance off are Sunetra and Brendan. 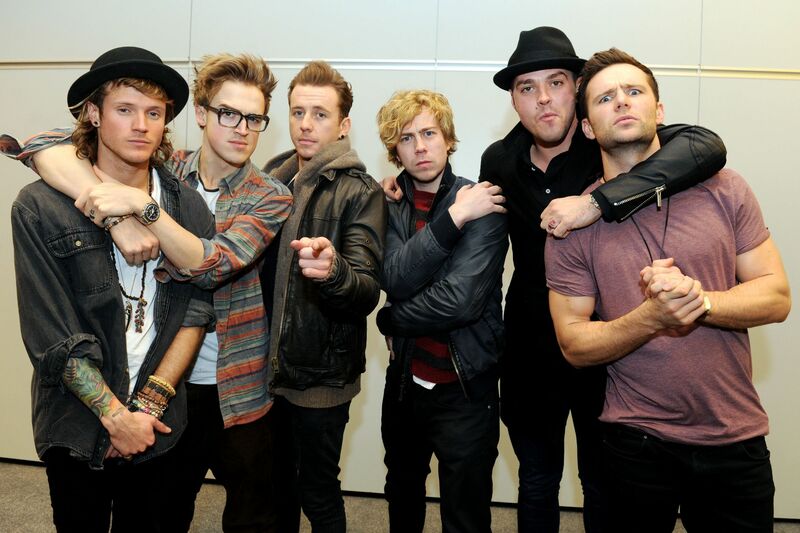 A mash up band from Busted and McFly perform their new single. Producers make sure Tess talks up drummer hunk Harry Judd, previous winner of the show. While he only won because he was a hunk and not full on skill, he was still decent on the show, then, mostly thanks to his dedication, not over-sexed partner. More mishaps and advice were given in the protruding lens of Len. by the judges. The results are back in and revealed. The rest through are, Simon and Kristina, Frankie and Kevin and Mark and Karen. 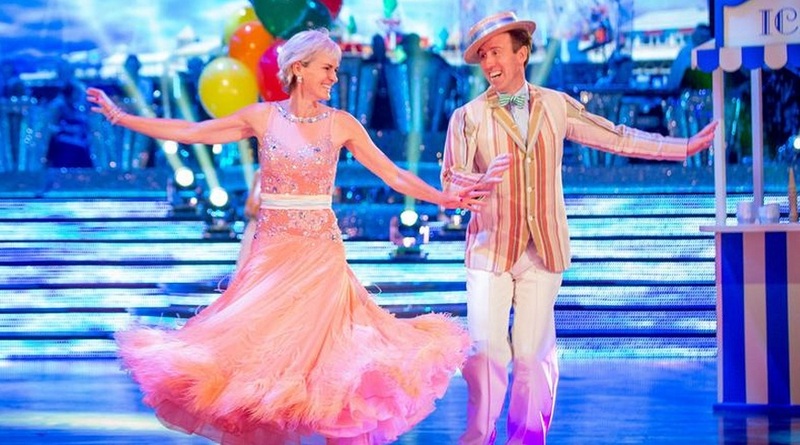 Facing the dance off will be Judy and Anton, leaving Steve and Ola safe for next week. Legend Dame Shirley performed a belter with one of her favourite Bond songs. Pure gold class with the Midas Touch. Iain Waite popped up to remind Zoe to get back to the sister show It Takes Two. A hilarious laugh was provided this end when someone unnamed and old added “Is that ‘er fella?” Might as well be. Charming couple they are. Did much better and this was best dance, but should not have been this long to go ahead. Too little too late. Better second time around and more free flowing but still needs bigger and better choreography. Give her a chance to dance and show her capabilities. The judges vote who should stay and who should leave the show. Darcey – Sunetra and Brendan. Bruno – Both highly entertaining. Sunetra and Brendan. We got lucky. Anton put up with me for weeks. But better than what I was. Made my experience very, very special. Anton also had a good word to say of his doubles partner. So excited and thrilled of experience for Judy. The fun we’ve had because of Judy’s sense of humour. Great sport. Enormous fun for me. Anton and Judy teased a Dirty Dancing lift moment as Anton slid up to Judy who then daringly jumped onto Anton in their last, fun filled dance. From the BBC, stolen by The Telegraph from here. Shameful. In respect to the Women of WWI the professional’s led a washer woman ensemble with Iveta missing her charming Anton. The boys later joined the fro in a great joint dance routine. 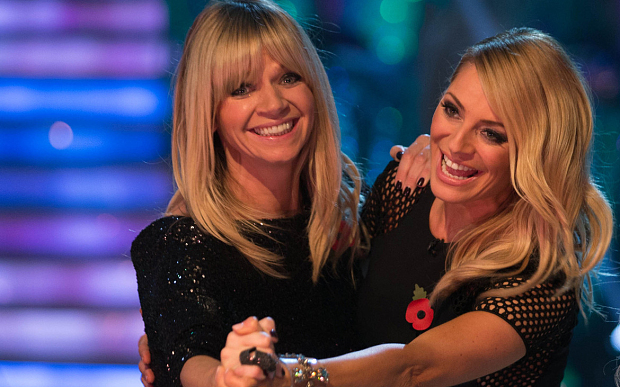 Tess Daly and Zoe Ball relay the results once again. Zoe rejoins the show as Claudia Winkleman is away since her daughter suffered burns on a Halloween party night out earlier int he week. FalseFabs wishes them all the best with their recovery. The results are in and only nine couples will make it to the dancers epicenter of epic proportions, Blackpool. Making it through, in no particular order are – Frankie and Kevin. Also through are – Sunetra and Brendan, Steve and Ola, Mark and Karen. The first to grace the danceoff is Alison and Aljaz. Operatic sensation Katherine Jenkins sang a beautiful rendition of a 1940’s classic with grace and serenity. Jake’s Rumba arms were under Len’s critique. Darcey explained the leg stand revolution from her first ten given to Pixie. Sunetra’s gaping was discussed by Craig who wanted them to be conjoined. Bruno’s lunatic animations were looked at, leaving Len ducking for cover from Bruno’s arm wafting. News Flash. Tom and Jerry are getting Strictlyfied. They”ll help Children In Need as well by making a cartoon of the judges. The rest of the results return now as the next couple are through. It’s Judy and Anton! Also though, in no particular order is Pixie and Trent, Simon and Kristina. The couple entering the dance off are Caroline and Pasha, leaving Jake and Janette to sail into next week. Start part, as stated before looks more like a Rumba, however routine was smooth, graceful and floaty. Got that Gabby Logan knock tonight. Easy to see why she landed there though as didn’t seem too oomphy even in a slow dance. Great cane to and fro-ing for the pair of Aces in the pack. 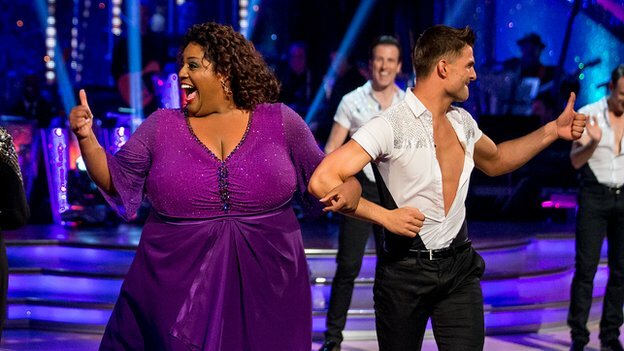 Big girl Alison proves ability to go with rest of them but has landed in dance-off due to hunk voting and old-age faves instead making mockery of show. Great showbiz once again with sheer razzmatazz! Craig – Best dance in dance off. Caroline and Pasha. Darcey – Caroline and Pasha. Bruno – Caroline and Pasha. Len – I did agree. Caroline and Pasha. Alison receives a standing ovation. Alison said of her time on the show. Caroline smashed it. Want her to get to the final and win. I’m still coming to Blackpool. Had absolute ball. Don’t care what colour you are, what size. Absolutely rock it. When I got ya from day one, I thought I’d won. Genuinely love you as a friend. Partner Aljaz had an equally glowing endorsement of Partner Ali. I’m extremely proud. I’m gonna miss you a lot. 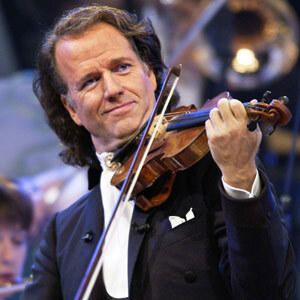 Sir Bruce Forsyth will return on the special themed Children in Need show with Tess this Friday for charity.